Come OUT into the streets with us for a performance-driven walking tour, placing audiences in the physical spaces of LGBTQ2+ ancestors. For centuries, the SOMA district has been a catalyst for radical change and a stronghold for queer and activist organizing. Come walk with us through the hidden histories of SOMA: from Native American Two-Spirit culture to the Folsom Street Fair, Lesbian auto-mechanics to labor activists and dock workers to drag queens. Rediscover the neighborhood once known as Happy Valley. Featuring Marga Gomez, Landa Lakes, Brian Freeman, Ryan Hayes, Kai Brothers and Maria David. Join us for our annual salon, deep in the heart of this historic queer neighborhood. 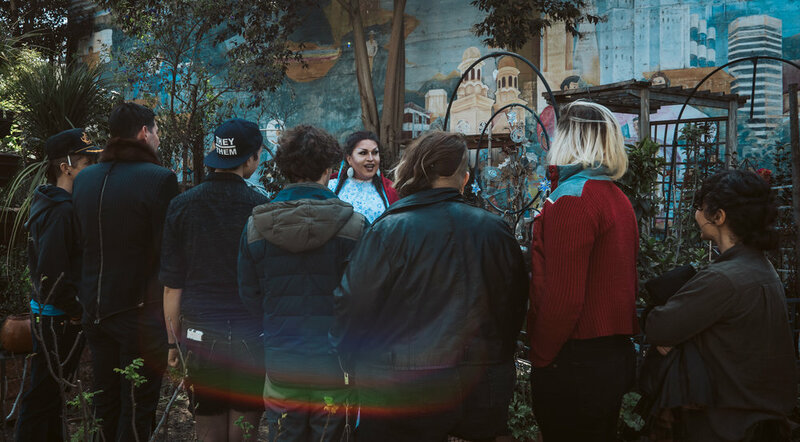 Enjoy scrumptious edibles, elegant wines, and site-responsive performance while supporting our second season of OUT of Site-San Francisco’s only immersive, queer-history walking tours. For press inquiries, please contact John Hill at johnhillpr@gmail.com For high-res photos click here. Eye Zen Presents is supported by CounterPulse's House Artist Program.